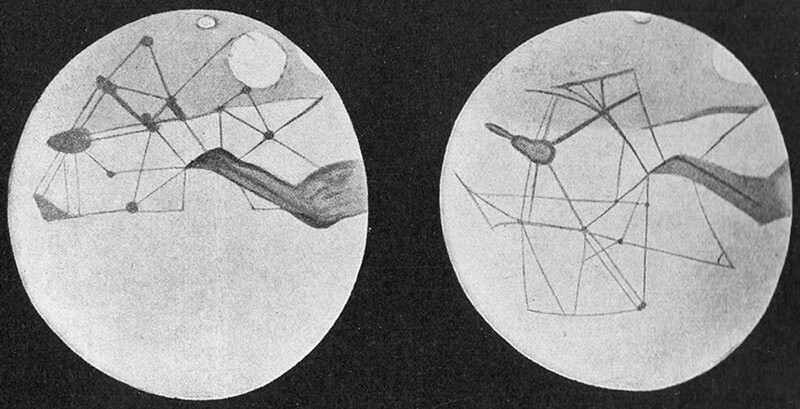 Public domain Martian canals, as depicted by Percival Lowell around 1900. By 1909, observations from the the 60-inch Mount Wilson Observatory telescope showed them to be optical illusions. Short attention span? Perfect, we understand each other. Each of these "connections" will take no more than 18 seconds to read. That's supposed to be the average duration of our short-term memories — good for copying down a phone number, hopeless (in my case) for remembering the name of someone I've just been introduced to. If you want to challenge yourself, keep a piece of paper over each answer until you've given it a whirl. What's the connection between novelist James Joyce and physicist Murray Gell-Mann? Quarks, which usually come in threes, are the fundamental constituents of matter according to the theory developed by Gell-Mann and (independently) by George Zweig in 1964. Gell-Mann happened upon Joyce's wordplay in Finnegan's Wake, "Three quarks for Muster Mark" (three quarts for Mister Mark), and the word stuck. Between Eugene Cernan and Mary Shelley? The Last Man is the title of a novel published by Mary Shelley, author of Frankenstein, in 1826. Cernan was the last man on the moon, 1972. Between the words "mausoleum" and "colossal?" The Seven Wonders of the World. The original mausoleum (350 B.C. ), one of the seven wonders, was the tomb built for Carian king, Mausolus, in present-day Bodrum, Turkey. Another wonder is the Colossus of Rhodes (305 B.C. ), a huge statue of the sun god built in Greece's Rhodes harbor. Between Hephaestus and Mr. Spock? Vulcan. The Greek god of fire Hephaestus is Roman Vulcan (hence the word volcano), while Mr. Spock hails from planet Vulcan. Between the author of I Kings 7:23 and William Shanks? The wrong value for pi. The Old Testament verse implies a value of exactly 3, while Shanks published a value to 707 decimal places in 1873. His error in the 527th place was only discovered in 1945. Between astronomers Fred Hoyle and John Wheeler, etymologically speaking? A popular astronomical phrase. Wheeler coined "black hole;" Hoyle came up with "Big Bang." Between Mars and fashion designer Elsa Schiaparelli? Giovanni Schiaparelli, the couturier's uncle, claimed to have seen "canali" (mistranslated as "canals" rather than "channels") on Mars in 1877, prompting the American Percival Lowell to build Flagstaff observatory to search for evidence of intelligent life on that planet. Between Ferdinand de Lesseps and George Goethals? Canals. They were chief architects of the Suez and Panama canals, respectively. Barry Evans (barryevans9@yahoo.com) will change the spelling to "connexions" when he rules the world.